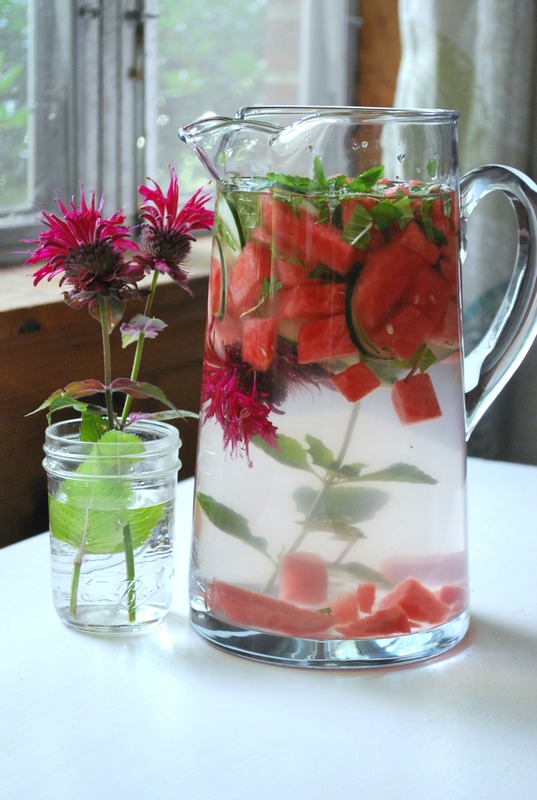 Bee balm and peppermint pair with cucumber and watermelon to create a refreshing infused water that you will want to make again and again during the summer months. 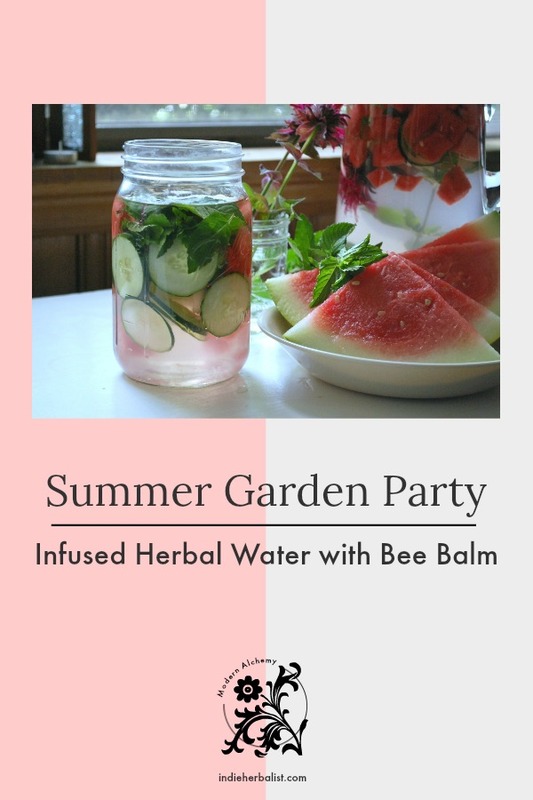 This recipe calls for fresh peppermint and bee balm, which means you will need to have them growing in your garden to take advantage of this seasonal recipe. Thankfully, both of them grow abundantly and with very little care once they are established in your garden. In fact, some people think these herbs cross the line from welcome garden guest to pest! If you are worried about them taking over, plant them in pots where their roots can easily be contained to prevent them from spreading. Or. 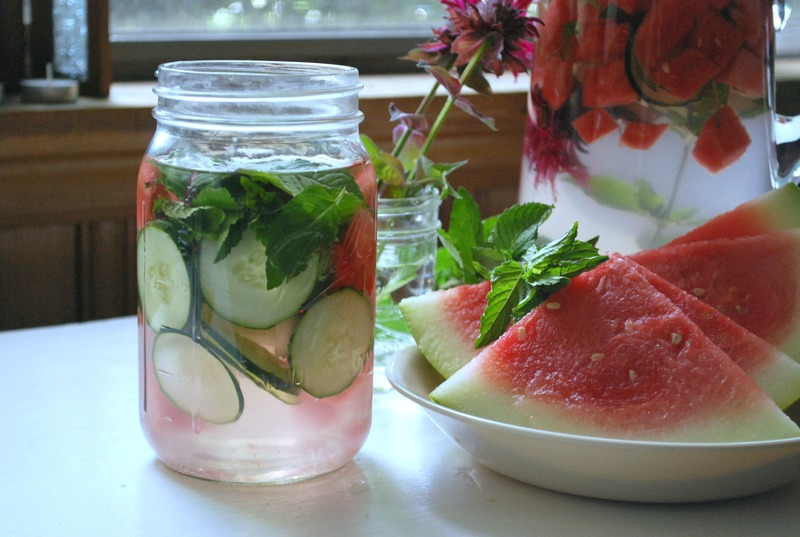 . . make more herbal infused waters! 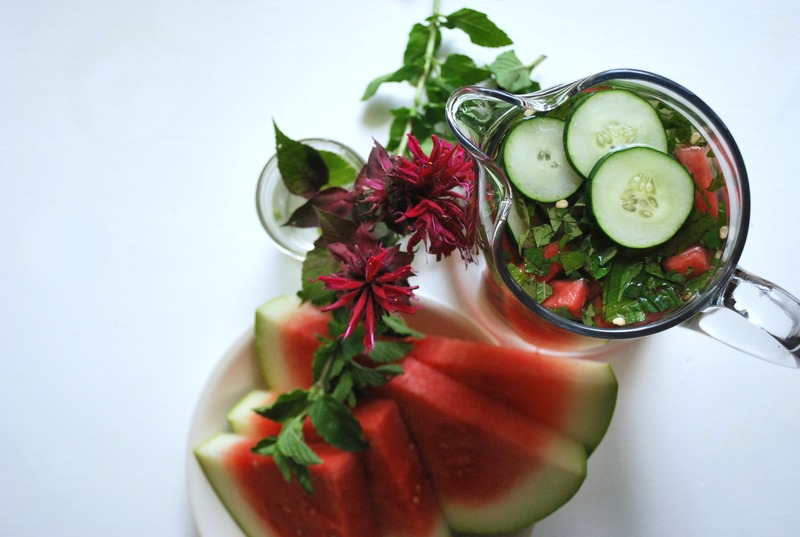 Peppermint is a cooling herb that can really help you beat the heat – especially when paired with watermelon. This herb has a familiar taste that needs no description, but you may not be as familiar with peppermint’s distant relative, bee balm. Most often described as somewhat sweet, with hints of oregano and bergamot citrus, this herb has a unique flavor all its own. As a matter of fact, bee balm comes in two varieties. Monarda didyma has a red, pink, or salmon flower, while M. fistulosa has lavender colored blooms. There are many garden cultivars that exist as well, with blooms of every shade of red, lavender, and pink. 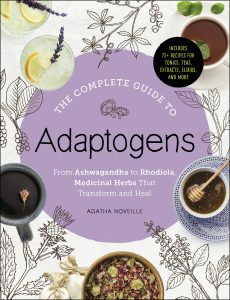 Although the two original species should be sought if you want the most potent herbal preparations, for this recipe it is fine to use any cultivar of either species with a pleasing aroma. Bee balm blossoms are stunning and quintessentially summer, which makes them perfect for celebratory summer libations. Read on for the recipe! Make sure your herbs are clean by rinsing them under running water. Other than that, there’s very little prep needed for this recipe! Sprigs of mint and bee balm flowers for garnish. 1.Pour 3 quarts of filtered water into a pitcher. 2. Roughly chop the bee balm and mint leaves and add them to the pitcher. 3. Add the watermelon to the pitcher and stir well. 4. Cover the pitcher and transfer to the fridge for at least 30 minutes before straining and serving. 5. Sweeten with a touch of honey or stevia if desired. 6. Add a few sprigs of peppermint to the serving glasses for garnish, and add a few bee balm flowers to the pitcher for decoration. You can leave the flowers on the stem with the leaves or take them off and add the flowers by themselves. Make Mine Agua Fresca, Please! The instructions here are for an herb and fruit infused water, but you could also turn this into a delicious agua fresca if your palate is more adventurous. For a more fruity, more traditional take on agua fresca, blend the melon, herbs, and water together in a blender (up to 4 cups melon per three cups of water), allow to sit in the refrigerator for at least 30 minutes, and strain through cheesecloth before serving. Bee balm is a wonderful addition to your spice rack, too! 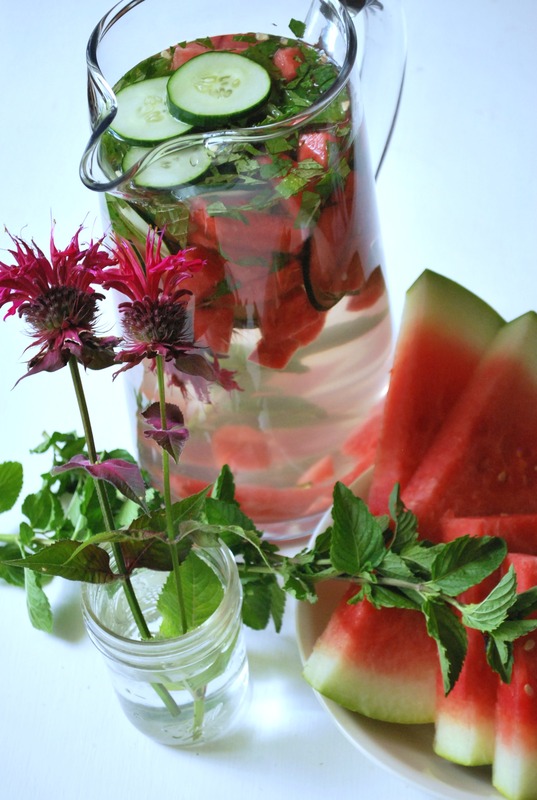 Read Creative Ways to Use Bee Balm in the Kitchen for more ideas. 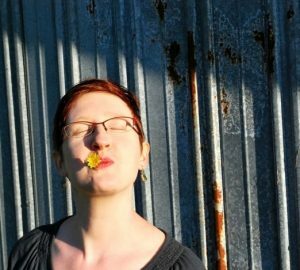 I’m an herbalist and author in Atlanta, Georgia. You can learn more about me (and my books) over here. That looks absolutely delicious! Is it too late in the year to try and make something like it? I’m sure the ingredients are much better when it’s freshest, but could I order fresh bee balm and mint leaves and make something that still tastes good? Hi Kaitlyn, thanks for stopping by! Yes, if you can find a source for your bee balm leaves you could still make this well into the fall. You could also substitute fresh lemon balm leaves for the bee balm since lemon balm can be a bit easier to find this time of year. It would be a different taste but still wonderful. Enjoy! This is just amazing. I found your site couple of days ago and already tried this and I must say – smells and taste so good. I love it.